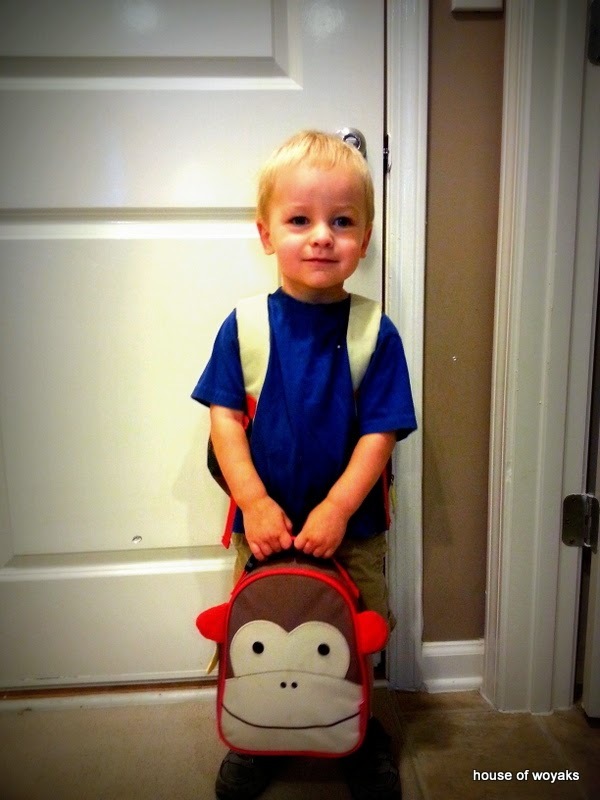 So, before I share the start of this new school year, let's take a look back at the first day of school last year! Look at that. Where did that big kids come from? The glasses are just awesome. We go in for a check-up in October to see what's next. 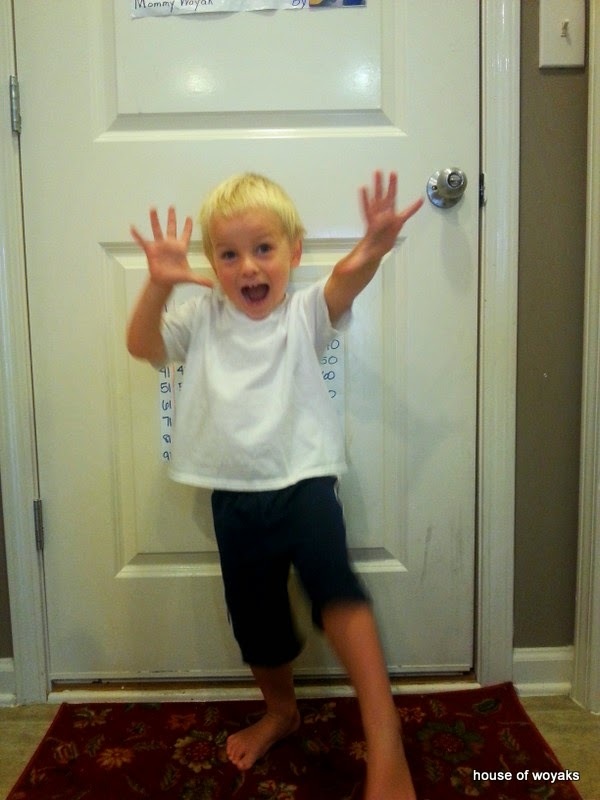 He will be 5...FIVE YEARS OLD!!! next month. Gasp! He is such a bog boy... No longer wants anything to do with Thomas. He just wants real trains. Real tracks. He is loving his Legos and will sit at the kitchen table for HOURS building all sorts of things. 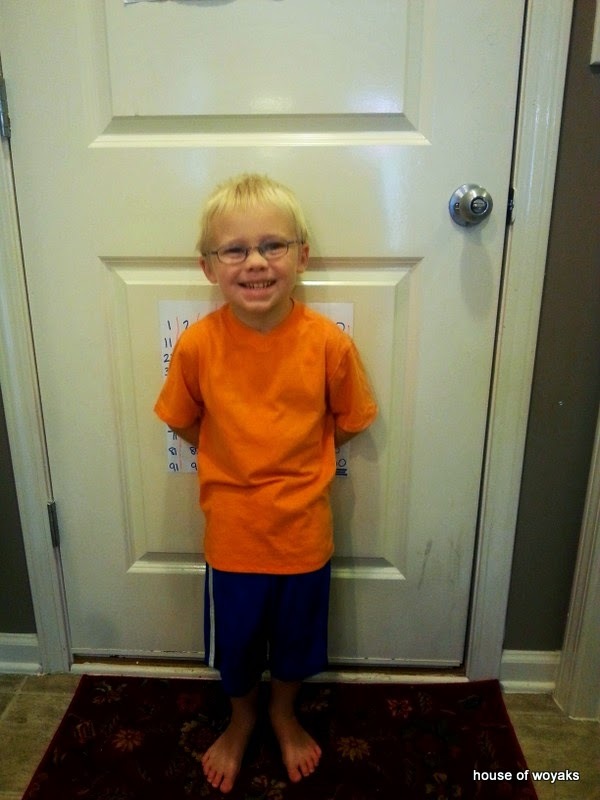 And, this is killing me just a tad...he no longer can fit in anything that has a "T" at the end. Yep, we shop in the big boys department now. No more 5Ts...it's all XS and 4/5/6 for this guy. And those feet! Those shoes from last year's picture...Alex can't even wear those anymore. Just amazing how much they grow in a year, right? Yes. I know. This guy doesn't just think he is awesome. He knows he is awesome. He is hilarious. We still have the "terrible threes" days (because everyone know that the terrible twos is just a load of you know what...two was NOTHING compared to three. Especially with this one. Oh. Dear. ), but mostly he is still my sweet little snugly guy. He talks nonstop. Wants to know everything about everything (Which I'm sure is all thanks to Sid the Science Kid - which is fine by me. Sometimes.). This book was great! So much fun! We "saw the world" via the ever-awesome iPad and made our apple pie. On the "beaches" of Jamaica having a French baguette and a crisp not-so-Vermonty apple! 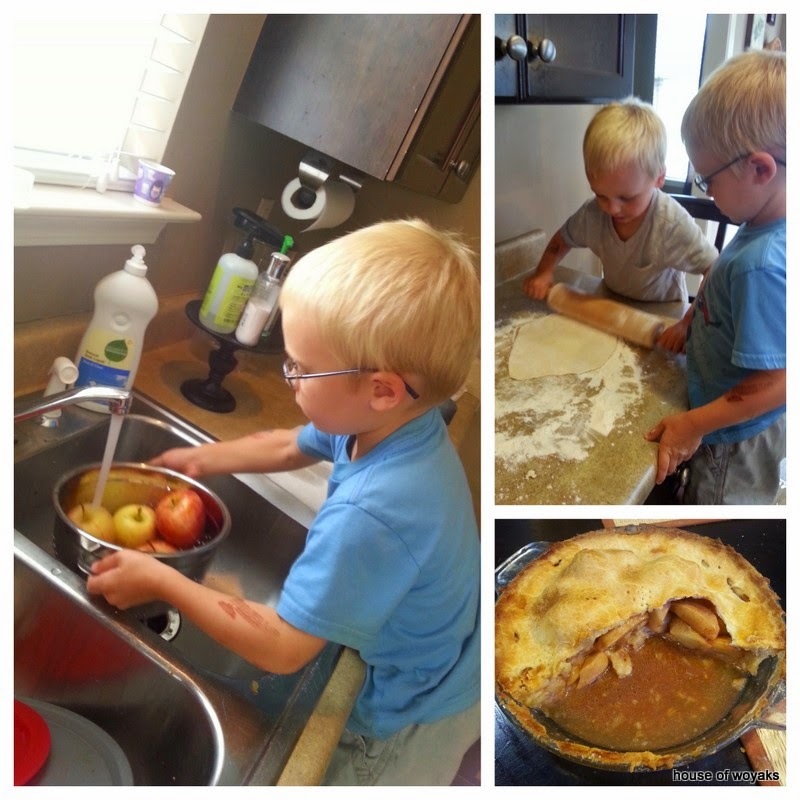 Making our homemade apple pie - the recipe was from the story, too! And that apple pie, my friends... That was think that made me realize that I have to have patience to homeschool because OH. MY. GOSH. The flour...oh, the flour... Yes, I knew it could get all over the place. And, it did. So, we also added in a lesson about science. As in, mommy's brain is going to explode all over this kitchen JUST like the flour if y'all don't cool it with the rolling pin. Good thing I had a little bit of Italy left in my fridge for later in the form of my favorite wine... It was fun overall, really. The boys learned about some amazing places and I learned that I need patience. Which I don't have. Can you buy it at Target?? For Twenty-Six Letters to Heaven, we learned about alligators (Which included...wait for it...a trip to the zoo! You had no idea, right? ), made some "A" crafts, and did a little something for St. Anthony! 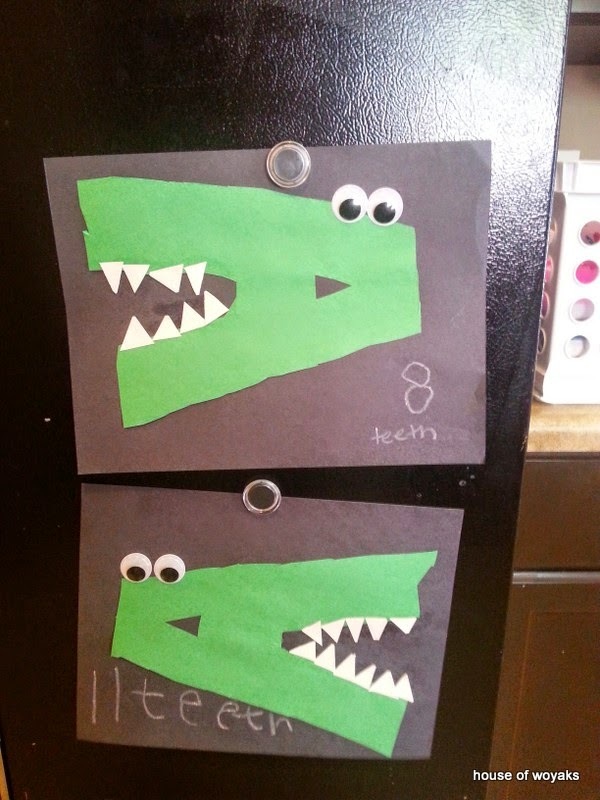 "A" is for alligator! Chomp-chomp! 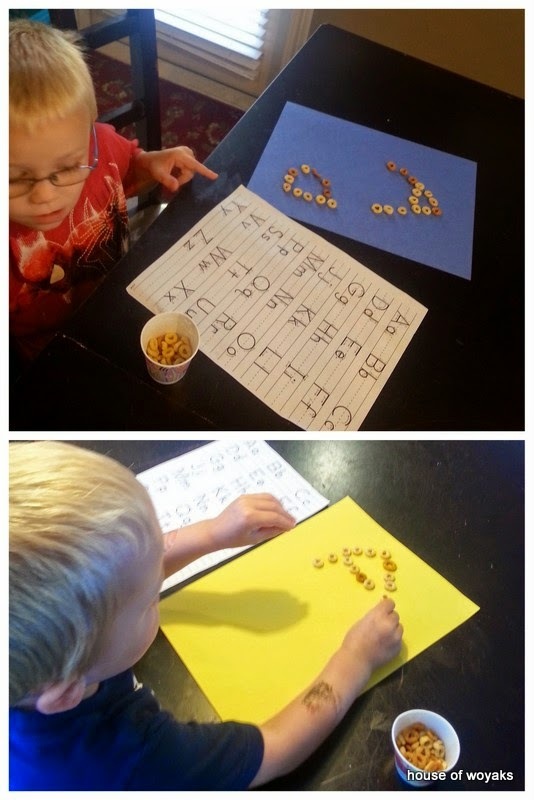 Made the letter A out of cheerios...which starts with C...better luck next week! Haha! Maybe there is more to it than those few words, but that is all I know so that is what I taught them. And, really, if anything...it does give a little patience and calms one down enough to actually think where the lost item would be. Only, I promise there is much more than that. At least for me - and now Jason believes it, too! He had lost his key to the van and some other item I can't think of right now. Well, I was helping him look every where for these things and I had not a clue. So, for kicks, I said the little diddy and suddenly I thought to look under the computer armoire... Why? I have no idea... But, jump back! BOTH ITEMS WERE THERE. Jason is just is complete shock and we are both laughing. Cracks me up still. Catholic "voodoo" what can I say? Kidding. Thank you, Saint Anthony. 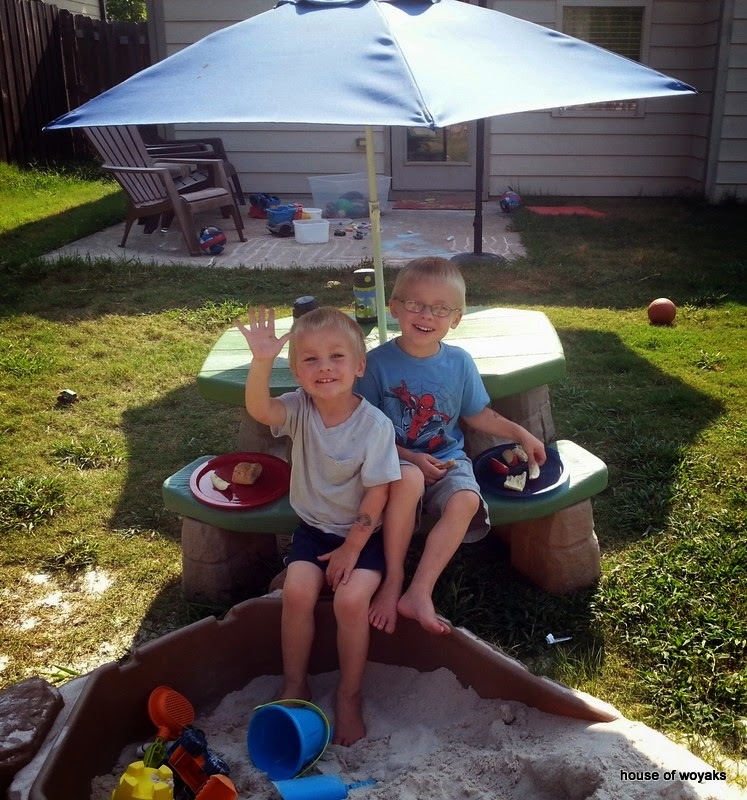 Another thing that we did - almost completely accidental - for Saint Anthony was recommended by one of my favorite authors, Lisa Hendey of CatholicMom.com. In her book, A Book of Saints for Catholic Moms, Saint Anthony was highlighted. For the activity she suggested baking a loaf of bread and bringing it to your favorite priest as a thank you for his service. Well, not only did we bake a load of banana-blueberry bread for him to take home, but we were able to have Father Jaya over for dinner! We have been working on a night that would work for him all year and we finally found a great weekend that worked out. And!! It just so happened to fall on this week! Crazy! 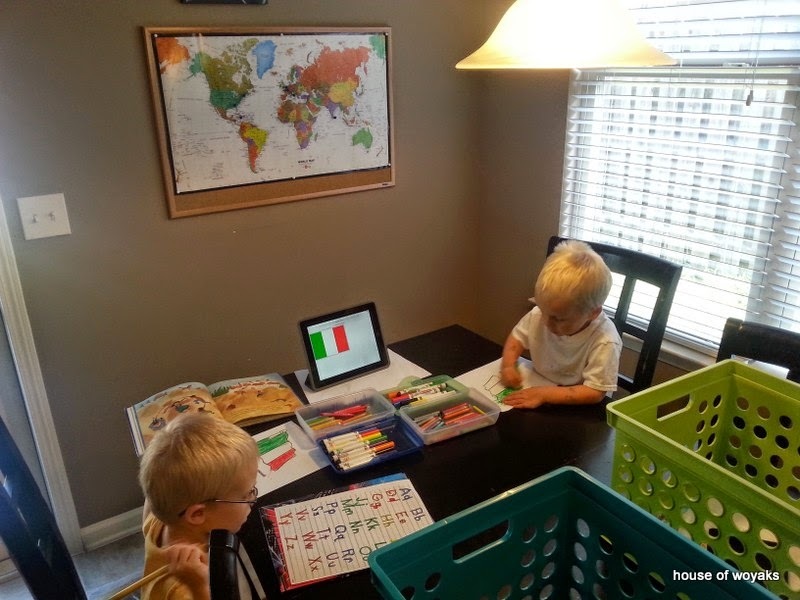 Maybe this homeschooling thing is exactly what God's wants us to do right now. Interesting how things just work out like that, huh? The stories he shared with us are just absolutely amazing!! So, so glad that we were able to do this and get to know one of our favorite priests a little better. Have you had a priest over for dinner? Or your pastor and their family over? I was nervous to begin with, but we had a great time! The stories he shared with us about India, his family back home, and his life as a priest are just absolutely amazing!! So, so glad that we were able to do this and get to know one of our favorite priests a little better. 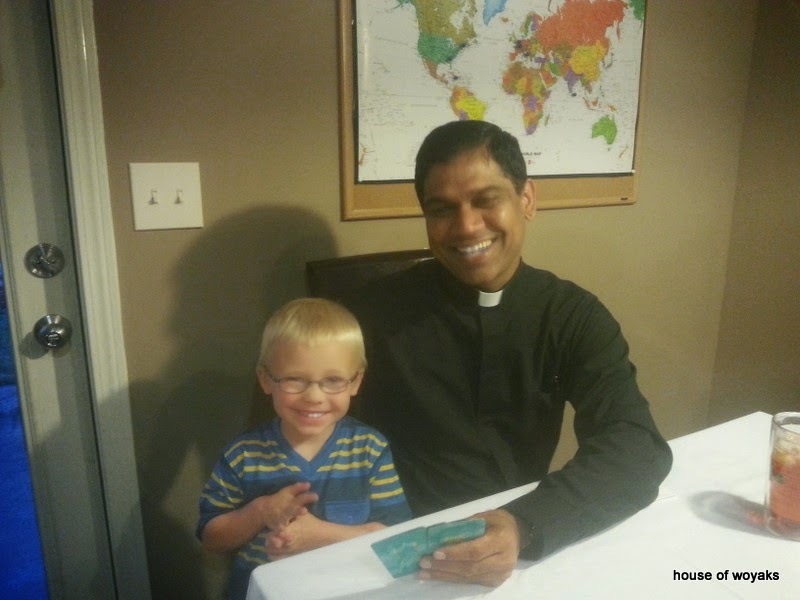 Father Jaya and Andrew - winners of round 1 and 2 of Go Fish! Don't worry! I didn't leave out the smallest one! Austin gets to play, play, play with everything he can get his hands on while we get our school work done. Luckily, I have a few tricks I pull out when I need him to be occupied. 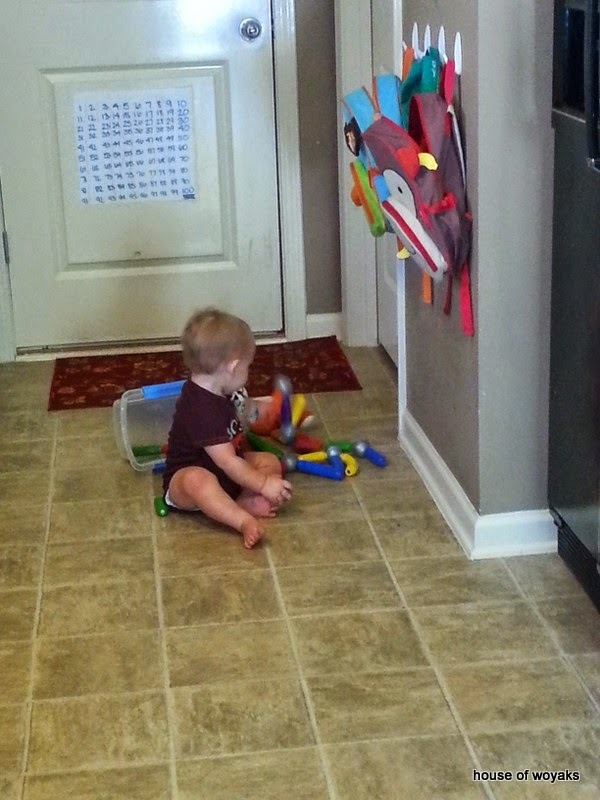 These magnet toys from Uncle Justin and Aunt Kate are his new favorite things to play with. He has figured out where I keep them, too (in the pantry behind him...). So he will actually go over there and bang on those doors for me to get them out. So funny. Love that little guy! There you have it! 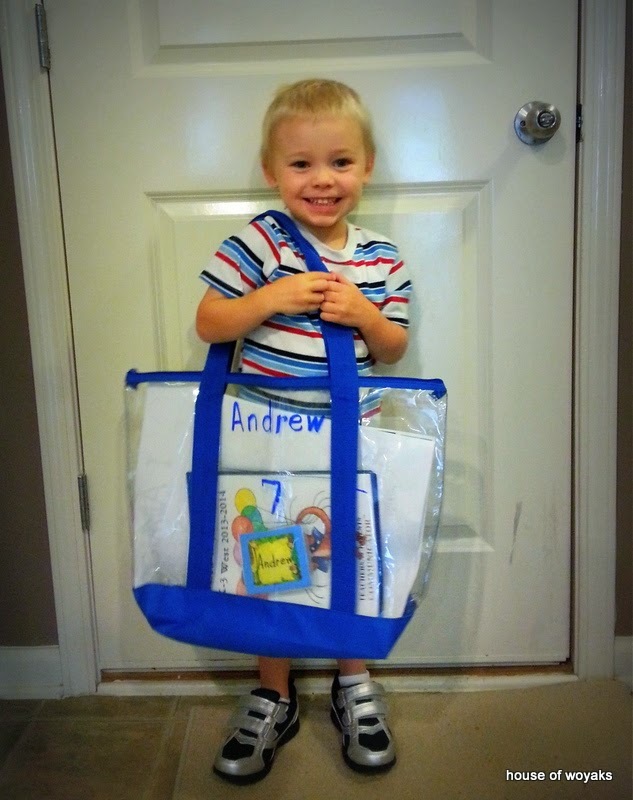 The first week of our preschool homeschooling journey! Lots of changes going on here, but were are having fun and learning something new each day.